You know, these days, it's pretty easy to forget how funny Eddie Murphy could be. In fact, it occurs to me that there are some people out there who may not know that he was ever funny. If all they've seen are his middle-of-the-road family comedies and junk like Norbit, they might be baffled as to why Murphy was ever allowed to make movies in the first place. In answer to that, I present those people with Saturday Night Live - The Best of Eddie Murphy, a compilation of 17 of the comedian's most famous sketches from the early 1980s. Watching Murphy's impressions of James Brown and Stevie Wonder, and his original characters like the pimp Velvet Jones and Mr. Robinson, the ghetto Mr. Rogers, after all these years, I'm reminded of how edgy and creative Murphy once was. This DVD contains the roots of so much of what was to follow in comedy. Not only would Murphy's "Black History Minute" and "Film Focus" (included here as a bonus) influence guys like Chris Rock and Chris Farley when they joined SNL years later, but with stuff like the "Little Richard Simmons Show" and the gay hairdressers he performed with Joe Piscopo (another bonus), Murphy was laying the groundwork for In Living Color. 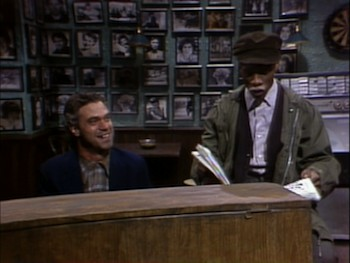 And without the short film pieces like the two-part (and overlong) "Buckwheat is Shot/Dead," the prison literary mockumentary "Prose & Cons," and the infamous "White Like Me," where Murphy dons whiteface and infiltrates the secret Caucasian underground, there would be no Dave Chappelle. Though some of the cultural references on the disc are dated--Reagan was President, Jesse Jackson was still a contender (Murphy plays him as a Motown-style crooner apologizing for his anti-Semitic comments through song)--the humor is still sharp. Murphy's parodies and impressions are dead-on, and though much of his material is cynical, there is at least one warm-hearted piece on this collection. The "Solomon & Pudge" sketch featuring Murphy and Joe Piscopo as two older men gabbing in a piano bar tugs more at the heart strings than it strikes at the funny bone. And since Murphy's character just lost his job, it's also timely. The one thing that kind of surprised me about this disc is that there are no big guest stars in the main skits. Where are all the high-profile hosts? Piscopo is in quite a few of the sketches, and the Gumby bit on here has the famous cast members Martin Short, Billy Crystal, and Christopher Guest, but most of the faces are otherwise unfamiliar. Well, except for the quick Stevie Wonder appearance in the final selection. 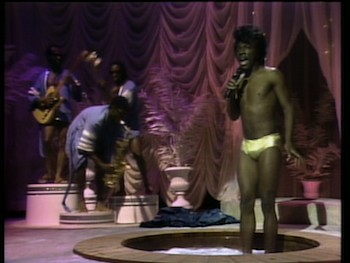 * "James Brown's Hot Tub"
* "Mr. Robinson's Neighborhood" - Word of the Day: Scumbucket. * "Velvet Jones" - The "How to Be a Ho" commercial. * "Black History Minute" - The true story of George Washington Carver. * "The Little Richard Simmons Show"
* "Career Corner" - Murphy plays the Tooth Fairy years before the Rock, tutu and all. * "Gumby" - The cartoon character in a Jewish deli, dammit. * "The 5th Beatle" - Murphy plays a man who goes on a music talk show and insists he was the originator of the Beatles. * "The Stevie Wonder Story" - The singer comes on and plays a man auditioning to play Stevie Wonder in a biopic. 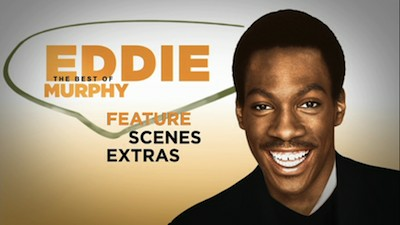 The full frame 1.33:1 image on The Best of Eddie Murphy actually looks all right for being from mid-1980s television. Some of the resolution is soft, but the colors have held up well and there is no damage to the original tapes. The Dolby Digital mix is very straightforward. It sounds fine, it's been cleaned up and there is no archival hiss or anything. Again, sounds pretty good given the older source. Closed Captioning is available for the deaf and hearing impaired. * "Monologue" - Murphy came back after he left the show and hosted, and this was his intro. It includes a couple of jokes also in Delirious, and it's actually from the first ever SNL show I saw in its entirety on its original airdate! * "Gumby & Letterman" - Gumby visiting "Late Night," with Piscopo as Letterman. * "Velvet Jones" - The pimp commercial. * "Guardian Angel" - A short bit with Murphy as one of the street vigilantes instructing viewers how to protect their gold chains. * "Focus on Film" - Murphy hosting a film show and interviewing Ron Howard, who had just directed Night Shift, and causing problems with the performer by only wanting to talk about his old TV characters. Highly Recommended. Saturday Night Live - The Best of Eddie Murphy is prime material from the comedian's best days. Featuring a bevy of his famous characters and impressions, the sketches still feel fresh and edgy to this day. Now packed with a bunch of extra bonus skits, there is a lot of great comedy here. One of the most essential of the SNL greatest-hits compilations. Maybe a bit of a rip-off for those who own the original edition, though your mileage may vary depending on how much you dig vintage Eddie Murphy.